For some reason, I had real trouble naming this recipe. It’s a sweet bread, with a cream cheese and chocolate chip filling. The filling reminded me of cheese cake, cheese Danish and cannoli, all rolled into one. Whatever you call it- it is really good. This would be a great brunch or breakfast dish for Easter morning. You could also serve it for dessert. It can be baked a head of time, and it even freezes well. It is sweet, but not too sweet. When I mixed up the filling ingredients, it was kind of runny. I decided to precook the filling, which worked out great. 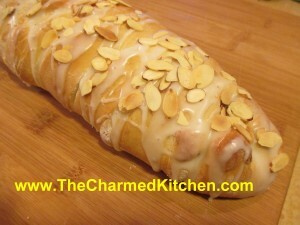 I used a powder sugar glaze for the top, then added sliced almonds. I could see adding a drizzle of melted chocolate, too. Well, maybe the next time. Set aside 1 cup of the flour. Combine remaining flour with the other dry ingredients in a medium bowl. 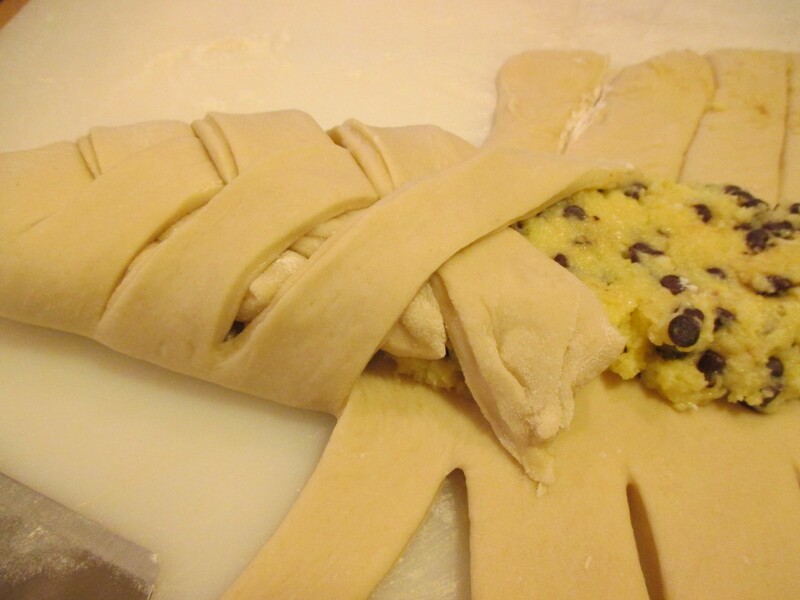 Stir in water and oil and gradually stir in enough flour to make a soft dough. Turn onto lightly floured surface and knead until dough is smooth and elastic, about 5 minutes. 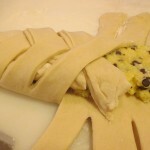 Cover and allow dough to double, about 30 minutes. Meanwhile, combine cream cheese with sugar and beat until smooth. Add eggs and vanilla and mix well. Mixture will be soupy. Place cream cheese mixture in a microwave safe bowl and cook, in microwave, on high, for 3-4 minutes, or until cheese mixture firms up. Let it cool down 10 minutes and then stir it. Stir in chips, if using. 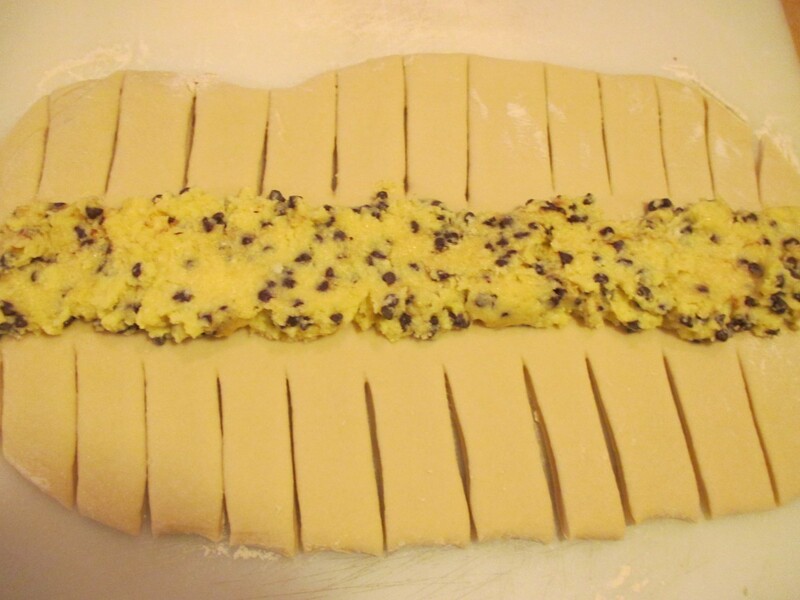 Roll dough into a rectangle about 16 x 8. Spread cheese filling down center middle of dough. 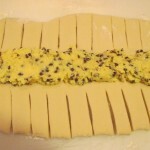 Cut one-inch wide strips of dough from filling to edge on both sides. It will sort of look like fringe. Alternating sides, fold strips up and over the filling at an angle. Carefully lift loaf onto greased baking sheet and place at an angle. Cover with a towel and set in a warm place to double in bulk, about 30 minutes. Bake in a preheated 375-degree for 20-25 minutes or until golden brown. Remove from oven and place bread on a rack to cool. Make the topping by combining powdered sugar with just enough liquid so you can drizzle it over the bread. Once the bread is cooled down, drizzle with the glaze. 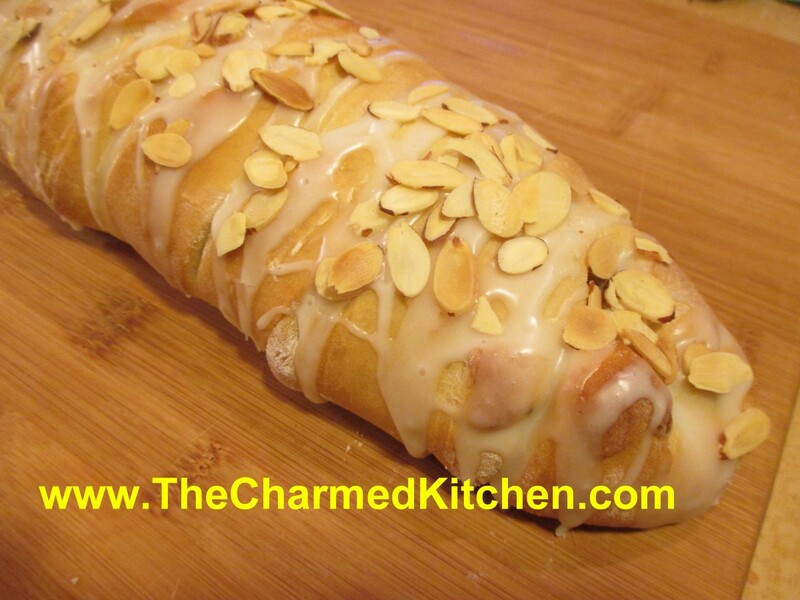 Sprinkle with the sliced almonds. Refrigerate leftovers. If you use regular yeast, use warm, rather than hot water. Also, it will take a little longer for dough to rise. *To toast the almonds, just place them in a skillet, over medium heat, and cook until lightly browned. 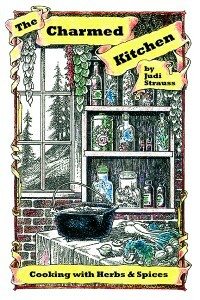 Stir or toss often and watch closely so they don’t burn.